How is data organised in OpenRefine? How do I access options to amend data in OpenRefine? What is the difference between Rows and Records in OpenRefine? How do I work with single cells that contain multiple values in a list? OpenRefine displays data in a tabular format. Each row will usually represent a ‘record’ in the data, while each column represents a type of information. This is very similar to how you might view data in a spreadsheet or database. As with a spreadsheet, the individual bits of data live in ‘cells’ at the intersection of a row and a column. OpenRefine only displays a limited number of rows of data at one time. You can adjust the number choosing between 5, 10 (the default), 25 and 50 at the top left of the table of data. You can navigate through the records by using the previous/next/first/last navigation options at the top right of the table of data. Most options to work with data in OpenRefine are accessed from drop down menus at the top of the data columns. When you select an option in a particular column (e.g. to make a change to the data), it will affect all the cells in that column. If you want to make changes across several columns, you will need to do this one column at a time. OpenRefine has two modes of viewing data: ‘Rows’ and ‘Records’. 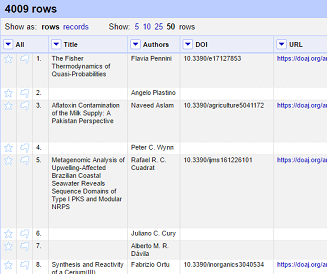 At the moment we are in Rows mode, where each row represents a single record in the data set - in this case, an article. 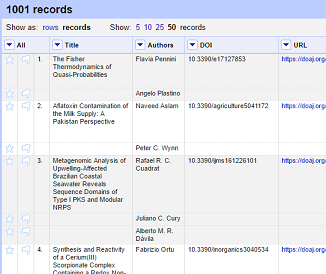 In Records mode, OpenRefine can link together multiple rows as belonging to the same Record. To see how this works in practice we can split author names into separate cells. If you look at the Author column you should be able to see that there are multiple names in each cell separated by the pipe symbol ( | ). Now that we can split multi-valued cells, we’ll cover how to join them back together. Modifying cells will be covered in future lessons, but for now we will cover how to join cells back together that have been split previously. Here we are specifying the delimiter character for OpenRefine to use to join the values together. You will now see that split rows have gone away - the Authors have been joined into a single cell with the specified delimiter. Our Rows and Records values will now be the same since we do not have any more split columns. The value that separates multi-valued cells is called a separator or delimiter. Choosing a good separator is important. In the examples, we’ve seen the pipe character ( | ) has been used. Choosing the wrong separator can lead to problems. Consider the following multi-valued Author example. with a pipe as a separator. Jones, Andrew | Davis, S.
When we tell OpenRefine to split this cell on the pipe ( | ), we will get the following two authors each in their own cell since there is a single pipe character separating them. Now imagine that the document creator had chosen a comma as the separator instead of a pipe. Jones, Andrew , Davis, S.
Can you spot the problem? Can you tell where one author stops and the next begins? OpenRefine will split on every comma it encounters, so we’ll end up with 4 authors, not two, because OpenRefine cannot tell that Jones, Andrew is supposed to be a single author. We will get the following four “authors” because there are 3 commas separating the name parts. Splitting on a comma will not work with Authors because the names may include commas within them. When creating a spreadsheet with multi-valued cells, it is important to choose a separator that will never appear in the cell values themselves. For this reason, the pipe character ( | ) is often a good choice since it is rarely used in data. Commas, colons and semi-colons should be avoided as separators. What separator character is used in the Subjects cells? How would you split these subject words into individual cells?